Combining the warmth of real wood with minimalistic white elements gives Gustav its friendly look – a welcome contrast to many traditional office environments. Compartments are easily accessible, designed around the size of the human hand. but big enough to fit all essential tools and belongings. 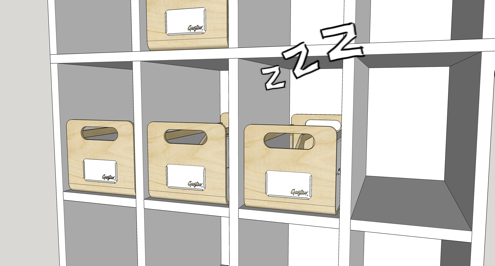 The product size is optimised so Gustav fits easily in a standard locker. Laptop stand for 13’’ and 15’’ laptops. Gustav Garage is 2.5 times more space efficient than traditional lockers. It allows users to store Gustav in different locations. A very cost and space efficient solution. Simply park Gustav, fast and easy. As experienced workplace strategists, we are happy to help find the best solution for your office. Weight: 1,310g for easy transport.